I have not written this sort of post in a long time. They did not seem very popular, I think Alice (Bright Town Girl) was my only fan lol. Anyway, I sometimes have lot of things I'd like to share but they are not worthy of an individual blog post. I am currently loving Pinterest for finding free from recipes. You may have seen my Vegan cinnamon buns but I also tried out Cheesy Broccoli Quinoa. Very easy to make, quite delicious and easy to adapt with some dairy free cheese (I use Cheezly). Rekorderlig have a new limited edition flavour, Passionfruit and it is currently exclusive to Morrisons. It very nice, refreshing and has a delicate flavour. It wouldn't be a catch up without mentioning cakes. I'm slowly working my way through Ms Cupcake cookbook. Pictured above are Vegan Carrot Maple and Nut muffins, they were delicious and full of cinnamon which is my favourite ingredient. The NU ME smoothie desserts were a find at Morrisons and I have enjoyed them in this hot weather. They are dairy free and the added bonus for me is no orange. I was jumping for joy over that as I struggle with avoiding orange when it comes to ice lollies. These smoothies are individual desserts in plastic tubs, very smooth and soft texture however one of the tubs was broken and I did get a mouthful of plastic so that's not cool. I can not remember if I have mentioned Amy's Kitchen Red Thai Curry and I'm too lazy to search my archives. I was sad that the Spaghetti Italiano has disappeared (at Tesco) in favour of this, as I'd like choice but the Thai Curry is delicious so I won't complain too much. Ready meal curry often contains milk so it is nice to finally have a free from option. The Lindt chocolate is a tale of sorrow. I grabbed this off the shelf in a hurry and only scanned the allergy advice label, it didn't mention milk so it went in the trolley. When I got home and decided to eat it, I took a better look at the ingredients and spotted butterfat. I really do not understand why the label does not mention dairy ingredients. 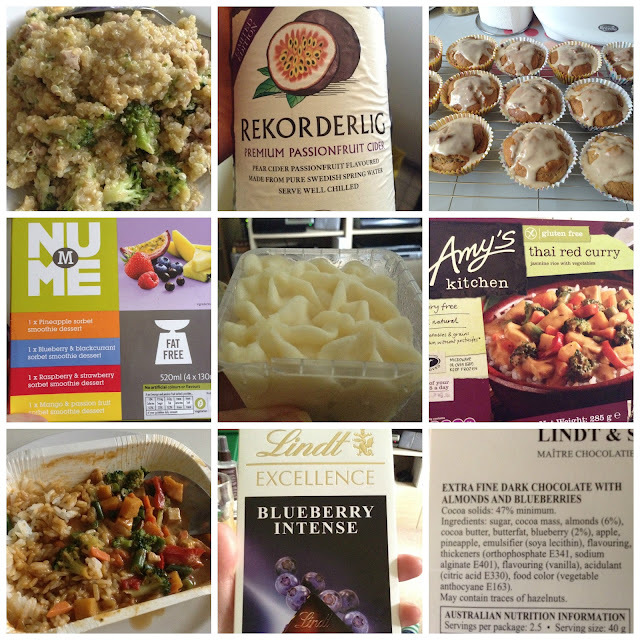 I think that rounds up the foods I have been loving recently. Feel free to leave a comment about anything your belly is currently enjoying. Have you tried items feature here? I love food!! haha. I'm a big fan of Rekordelig, so other than wine that's probably the only alcohol that gets in my belly. :P Haven't tried the new one though. Also love Lindt chocolates. But my all time favourite snack is popcorn. p.s I like these posts! I've made that mistake before with Lindt - I also luckily looked at the ingredients before I ate it though!